Torches remain charged and ready, they light up automatically in case of a blackout in hazardous working environments, such as the oil and gas sector. Within hazardous working environments, safety equipment remains a crucial part of any installation in order to secure daily operations. Through collaboration with leading suppliers and key operators in the North Sea, the Norwegian company Hernis has developed a solution for portable lighting equipment. Their focus: increased safety, improved reliability, and reduced maintenance. The Reference Ex torch satisfies the strict requirements for use in the process industry and on oil platforms. In closed areas where gas and vapour can create an explosive environment, specialised electrical equipment needs to be developed with safety as a main factor. The Reference solution allows torches to be recharged in Zone 1 environments, and operated within Zone 0 conditions. Reference is a new brand managed by a special division within Hernis Scan Systems - a Norwegian-based company specialising in the design and production of surveillance equipment for the oil, gas, and maritime industry. Hernis is also a part of the NODE Group in southern Norway - a major base for suppliers to the oil and gas sector as well as renewable energy. Reference Sales and Marketing Manager, Einar Lende, points to the industry as the main driving factor for success. Even though the general principle of induction have been around for decades, the patented technology embedded in the Reference system has been upgraded to achieve a significantly higher efficiency level with lower heat exhaust. The concept and technology has been refined for four years with the main goal of eliminating current operating limitations surrounding existing alternatives, and improving key operational features. In addition to focusing on safety, this also makes the Reference Ex torch versatile covering a broader range of requirements. 'Anything that can go wrong will go wrong' is the popular summary of the legendary Murphy's Law. Einar Lende, Reference Sales and Marketing Manager, says the Ex torch is meant to provide insurance against such situations. "Our product is proving to be a Murphy's Law eliminator in that regard. The enhanced charging system remains unaffected by any corrosion, oil or harsh weather condition. Torches remain charged and ready, they light up automatically in case of a blackout, and perform their own inspection and maintenance on internal components on a regular basis. Hence, the human error factor has been greatly reduced." The Reference torch and charger have evolved in part through dialogue with several key operators in the oil and gas industry. Major contributors within the industry have done their part during trial tests, relaying valuable feedback in order to optimize the end product. Steve Foy, Authorised Electrical Person at Forties Charlie oilfield, a division of Apache Ltd. North Sea operations has firsthand experience with the solution: "The torch brightness and distance of beam is excellent, ease of use is good, and battery life is exceptional. You can easily get 4 to 5 hours worth of continuous use without recharging." At Transocean, they emphasize the importance of maintaining work efficiency, and being able to locate functional flashlights whenever needed: "With permanent charging stations locally, torches are more accessible and less likely to be missing whether it's the drill area, shaker, mud room, or pump room. The torch is suitable for multiple uses and with no risk of drained batteries at times they need to be operational," explains Rig Manager at Seacher, Pål A. Svensen. In addition to having received very positive feedback on the Reference torch as an operational lighting solution, general interest has also triggered new possibilities and areas of application. A major contributor, Statoil, conducted a nine-month trial project at an oilfield in the North Sea. During the summer of 2009, the company decided to implement the product as standard portable emergency equipment within each sleeping compartment on the Visund oilrig. "In case of a blackout, the lights turn on automatically. As our system satisfy the strict certification requirements, they can be made more accessible in zones where it's very important to have access to light in the event of an emergency," says Einar Lende. 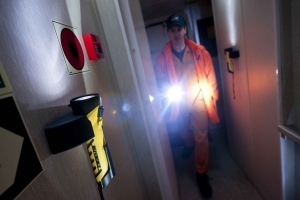 Close to 100 sets were installed at Visund, and in addition to the automatic emergency lighting feature, the solution functions as a portable and reliable light source in the case of an evacuation. With an estimated installation time of ten minutes per compartment and a self- maintaining battery, it is hoped that Reference will become a standard within offshore accommodation areas. As a result of the Visund installation, other operators within the oil and gas industry have started to show interest in modernisation, and may follow in Statoil's footsteps the coming months. Einar Lende is pleased with these latest developments, and he believes that over time the torch range has the potential to reach many new market segments and application areas as both a safety device and an operating utility. During the development phase, various components and technology were thoroughly evaluated with enforced security and long term operational life in mind. The charging system utilise galvanic power transfer; eliminating conductivity problems commonly experienced with exposure to saltwater, oil spills, and extreme weather conditions. Removing any exposed metal contact within the charging system eliminates problems due to corrosion, oil, or mud. There are no metallic charging nodes that could be covered with mud or even erode away and direct water exposure will not short circuit the system, explains Einar Lende. Programmed routines perform specified tests on both torch and charger in order to monitor systemic conditions. Automatic charging routines are performed at scheduled intervals to ensure optimal battery capacity, and to maintain long-term durability. An internal processor initiates these tasks on a regular basis when the torch is positioned in the charger unit, and produce feedback through a small LED indicator if any faults are detected. In order for optimal projection when using a high efficiency light emitting diode (LED) light source, a corresponding 4 degree lens was imbedded behind 3mm of scratch resistant hardened glass. The lens produces a bright and uniform light, capable of lighting up objects at far distances. The LED itself is solid with no inner filaments or fragile glass, and has a life span of more than 50,000 hours. Unlike a filament, which must gets intensely heated in order to emit light, the LEDs do not waste energy, and operate even below a single watt. The Reference solution has been based on wireless technology developed by the company Wireless Power and Communication (WPC) in Kristiansand, Norway. During the past nine years, induction technology has taken a great leap forward, both in terms of transfer efficiency while at the same time keeping heat exhaust to a minimum. "Our solution is capable of transmitting hundreds of watts with a potential of 95 per cent efficiency rate. The possibilities of application are therefore mostly limited to potential ideas and economic viability, says Geir Olav Gyland at WPC. WPCs improved and patented solution opens for a wide range of other industrial applications transferring not only power, but also video and data packages. The technology allows transfer in a sealed system, offering a safer and more reliable solution for hazardous environments, whether the obstacles involve hydrous, highly erosive or potentially explosive areas. Industrial projects involving subsea cable connectors have already been developed based on WPC technology.